AC cords and plugs are varied depending on their matching power supplies and voltage, amperage and safety designs. Generally in the film, video and photography industries any cord that supplies full 120volt AC power to a converter, transformer or to the chassis of the electronic item itself is referred to as an AC Cord or AC Plug. The terms usually implies that the item being plugged in is a nominally low power draw item. One of the most common AC plugs in use in the US is the C7 style plug-end. One end of the cord is a standard 2-prong male plug-end that is designed to insert into a standard US 'edison' outlet. The C7 style plug provides 120 Volt (also called 110V) to any number of designs of power transformers, conditioners or converters. The double-rounded end is a female fitting that is inserted into the power adapter box or the electrical unit itself. There is a polarized version of the C7 AC cord plug-end called the C7P. It has the same internal female pin spacing and one end is rounded with the same dimensions as the C7 but, the C7P has a flat edge along one side of the plug-end that requires the user to insert the plug-end in only one direction. This will help align any power source polarity of conductors and be sure that the proper feed power and neutral return lines are correct. The next most common plug-end connector is the IEC. This AC plug connector is a female end of an AC cord and has a rectangular shape with the top two edges chopped at 45 degree angles. Some refer to it's shape as resembling a 'house'. 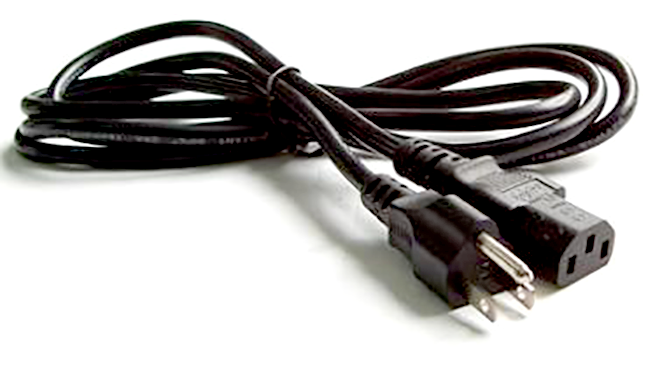 The IEC AC cord plug-end has an AC feed connector (hot wire) an AC return connector (neutral wire) and a safety connector (ground wire). The IEC style AC cord plug-end is inherently polorized by design to prevent being plugged in 'backwards'. Another style of AC cord plug-end is the 'Mickey Mouse' style cord end. This syle plug-end is also a self-polarizing connection. Stinger is the film industry nick-name given to the common extension cord. The main difference bewteen a stinger and a regular extension cord is that a singer is made of industry standard, high quality cable that is rated for the full amperage requirement of industry lights and tools. Extension cords are often inferior in build and function quality when compared to custom built industry stingers.